- Releases up to 30 ml of moisture an hour to work as a humidifier. - Waterless auto-shut off and incredibly quiet operation. - 4 time settings give you total control (1hr/ 3hr/ 6hr/ steady on). - Rubberized feet ensure added stability to reduce risk of spills. - Conforms to stringent American and European safety standards. touch of style that won't go unnoticed. LONG OPERATING TIME: The 300ml capacity of this Asani ultrasonic essential oil diffuser provides misting action for up to an unmatched 10 hours. This large oil diffuser is perfect for bigger spaces, comes with 4 time settings to create customized sessions, and features waterless auto-off functionality for added safety. ENJOY THE LIGHT SHOW: You'll love the LED band on this electronic oil diffuser that produces a series of colors in soothing hues to revitalize your spirits. You can choose to cycle through all 7 colors, stick to just one, adjust the brightness, or turn the lights completely off. SPRUCE UP ANY SPACE: We've given this stunning essential oil diffuser plug-in machine a wood grain finish look to complement the gourd-styled shape. 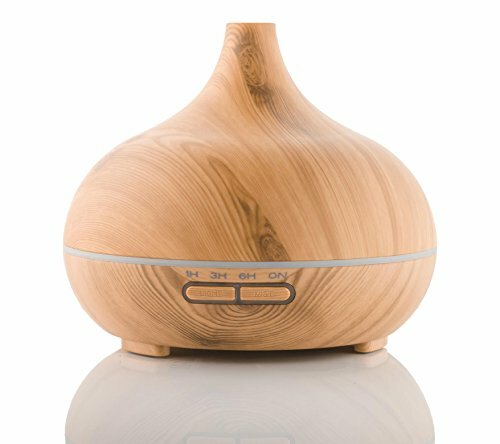 The earthy character of the essential oil diffuser gives any space a zen feel, which combines with the whisper-quiet operation to create total tranquility. PURIFY YOUR AIR: Ultrasonic vibrations of the home fragrance oil diffuser keep the structure of your essential oils intact.This lovely essential oil mist diffuser also works as a humidifier to release up to 30 ml of moisture an hour into the air. NO HASSLE LIFETIME WARRANTY: Asani and its supplier, MLC distribution, has got you covered with a worry-free lifetime warranty. We'll gladly replace your aromatic oil diffuser at any time in case of any dissatisfaction. Enjoy a CE, RoHS, and UTL certified product without having anything to lose. If you have any questions about this product by Asani, contact us by completing and submitting the form below. If you are looking for a specif part number, please include it with your message.